“1” – That is definitely the “Loneliest Number you will ever know”; but not as lonely as you will be when all your friends are running the Coyote Cohorts Backbone Trail Ultra on March 15 and you are NOT! Today is the last day to sign up for this running party, journey, vision quest, walk in the woods (well chaparral is as close as we get here in Southern California), adventure crawl and ambulation. This entry was posted in Uncategorized on February 15, 2014 by gravityh. “10” – a familiar number…; you see it every day.. fingers or toes, (except for one of my running buddies who has seemed to merge a few toes together); base 10, the numbering system we use and live by every day.. a coincidence… think not..; Ten, Pearl Jam’s first album.. or the number of times you stubbed your toe in the last 10 miles of your last adventure run…. BUT MORE IMPORTANTLY……10 is the number of days you have left to sign up for the Coyote Cohorts Backbone Ultra Run. So get on over to Ultrasignup and feel like you are STILL ALIVE …. See you on the trail… woop woop.. This entry was posted in Uncategorized on February 6, 2014 by gravityh. Still Searching for the Yeti? 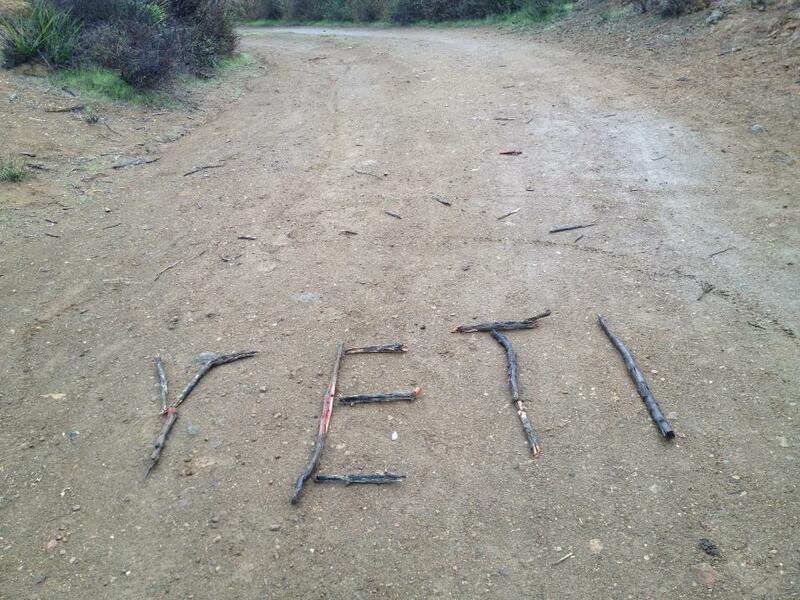 There are more slots open for you to join the search for the Yeti on the Backbone Trail. There were reports of some runners spotting the Yeti last year, or were they hallucinating in the final miles? Get a shot of the Yeti or bring a convincing story to the finish line and win a lifetime’s supply of Chutzpah and Peeps. Oh yeah, and prices go up on January 1st. Whatcha’ waiting for? This entry was posted in Uncategorized on December 26, 2013 by gravityh. We all use the trails and they need our love too…. H’ard Cohen is organizing a special trail runners trail work day with the Santa Monica Mountains Trails Council (SMMTC) on Saturday December 7th. We will meet at Wendy Trailhead and run to the trail work site at the junction of the Tri Peaks Trail and the Backbone Trail. This is not an easy trail but great training and a little rock hopping. We will meet Trail Crew leaders with food, water, and tools then proceed to work on the Chamberlain Trail all the way down to Danielson Ranch. From there we can hitch a ride back or run back to the trailhead. There are different options for running routes and I will suggest some as we get a list of runners. This is a great chance to be with your running friends and support the trail system. We need a FIRM commitment from all the participants to ensure we can support the runners with Trail Crew Leaders, tools and rides. I think we could all use the extra miles and this will be a great day of training and giving back to the trail running community. Details can be found here. 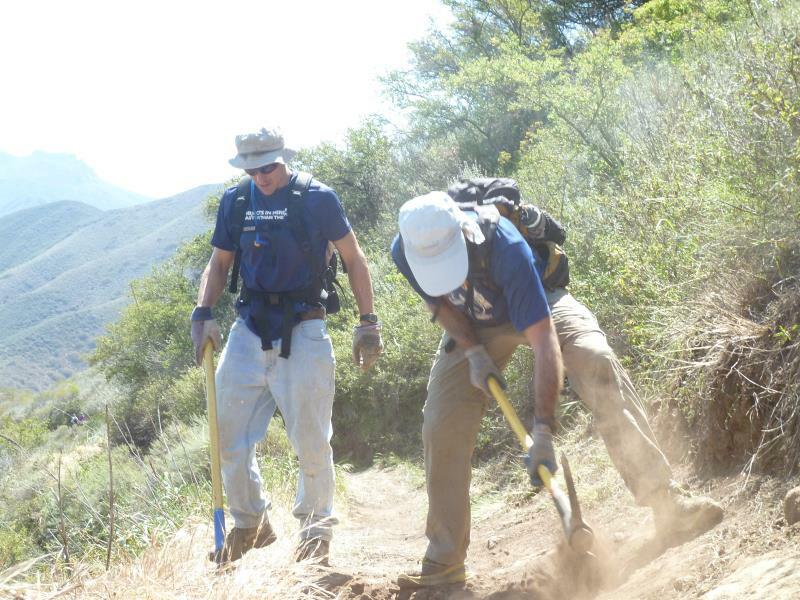 If you can’t make this trail work day then visit the SMMTC website and see their schedule here. Look forward to seeing you out there pitching in on the trails. This entry was posted in Uncategorized on December 2, 2013 by gravityh.